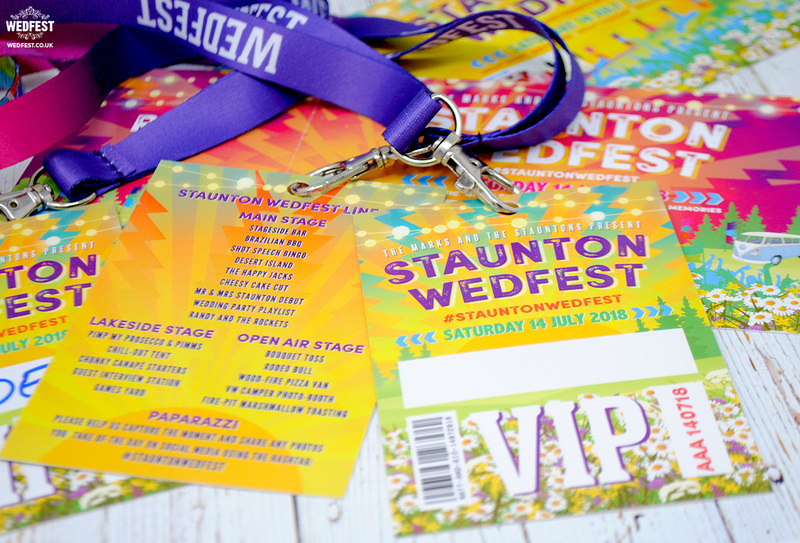 For their big day they wanted us to create festival ticket wedding invitations, festival wristbands for their wedding guests to wear on the day of the wedding and festival vip lanyard passes which doubled as both the wedding place name settings and also the line up of what was happening at Staunton Wedfest. 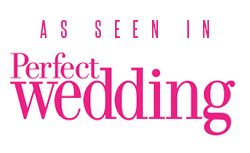 As always they came to the right place and we got to work. 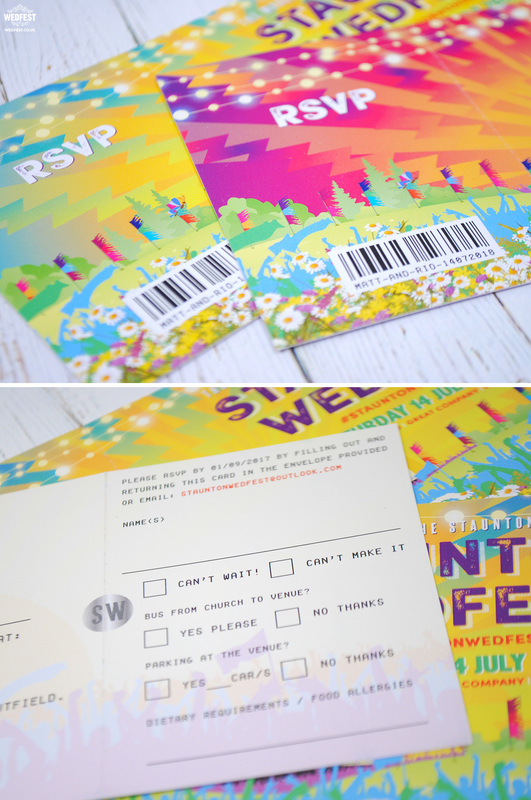 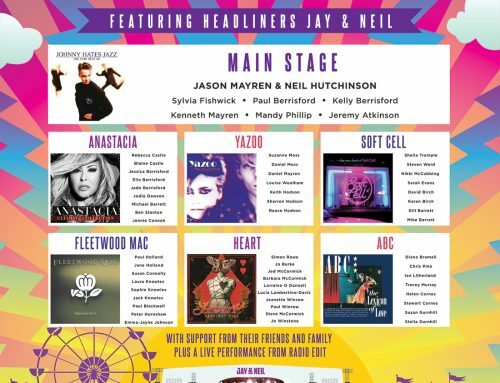 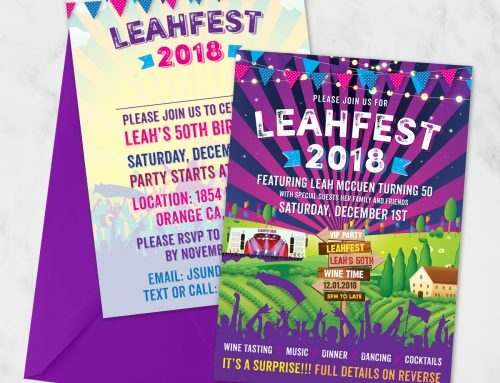 For the festival wedding invites they wanted them to look like a festival style party in a field as thats exactly what their wedding day was going to be. 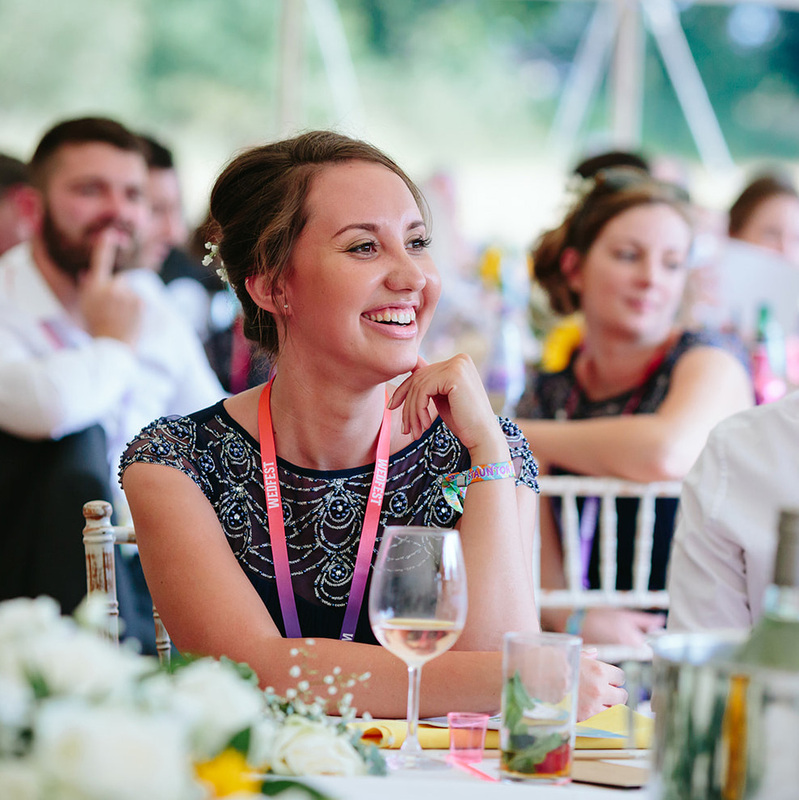 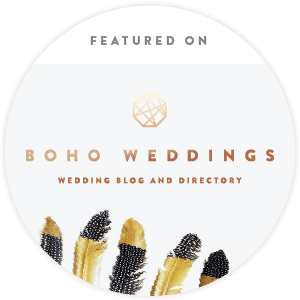 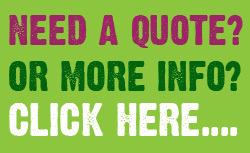 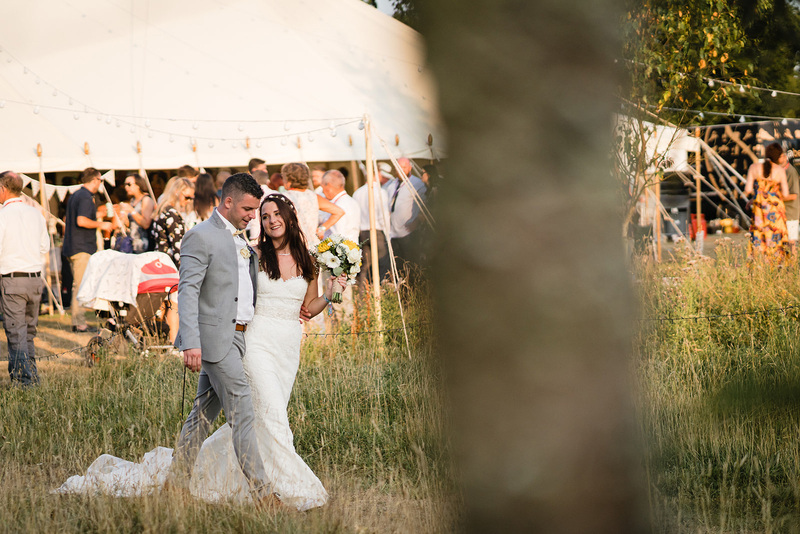 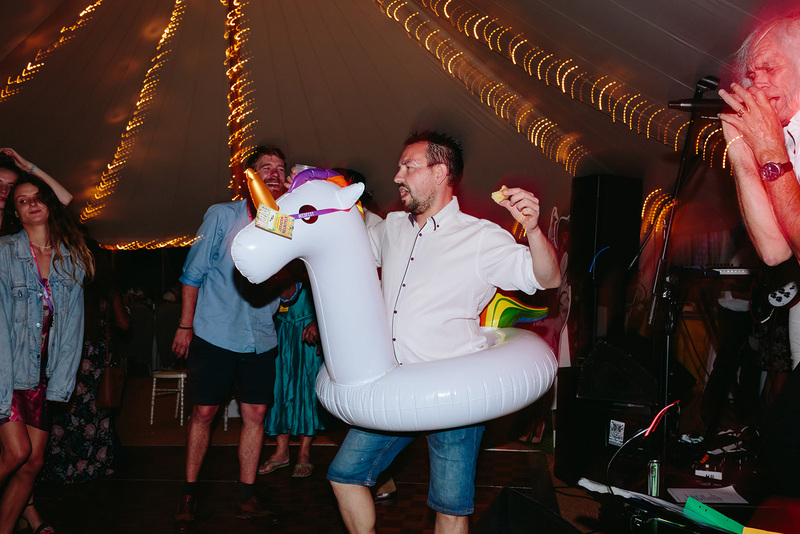 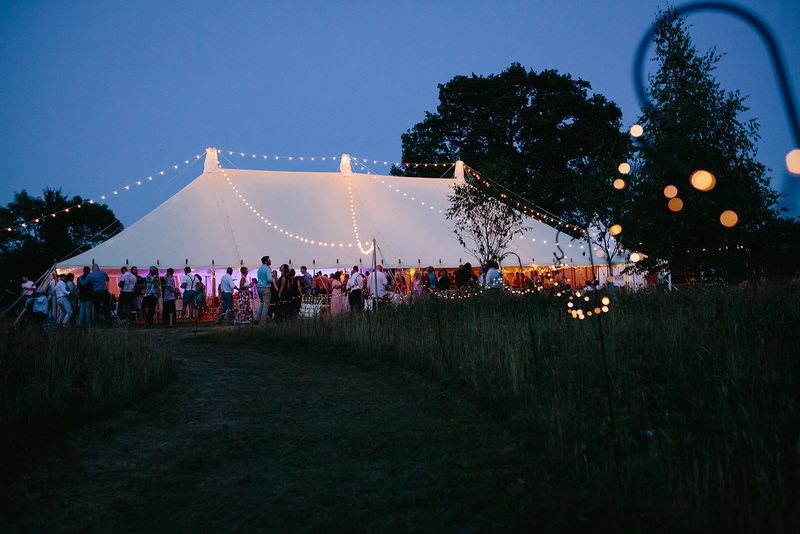 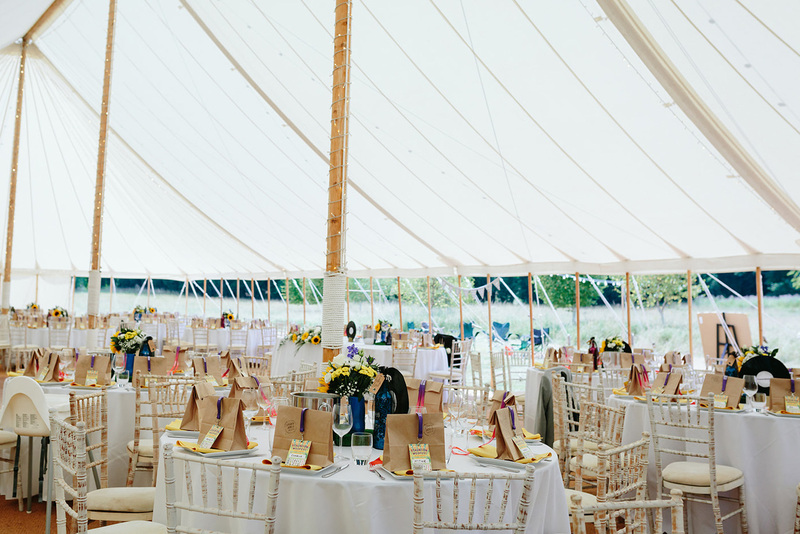 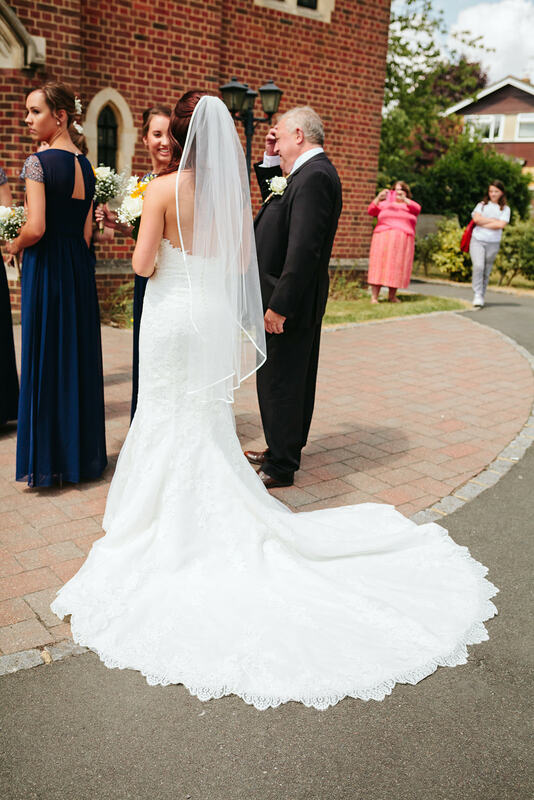 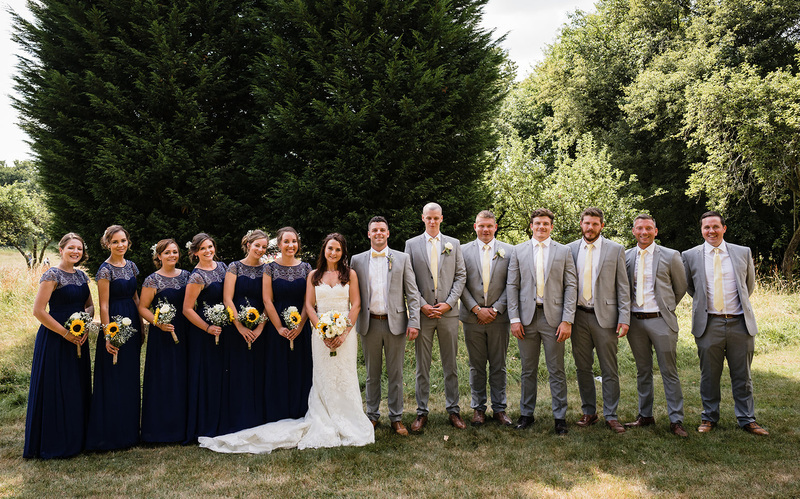 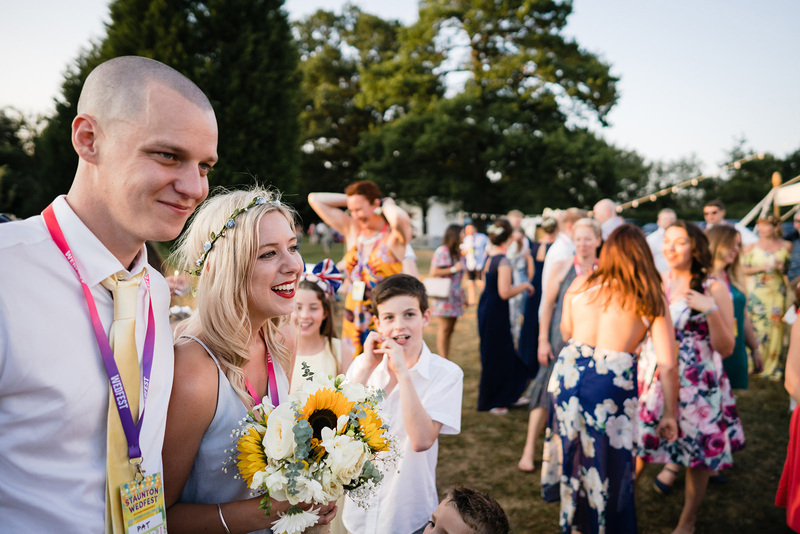 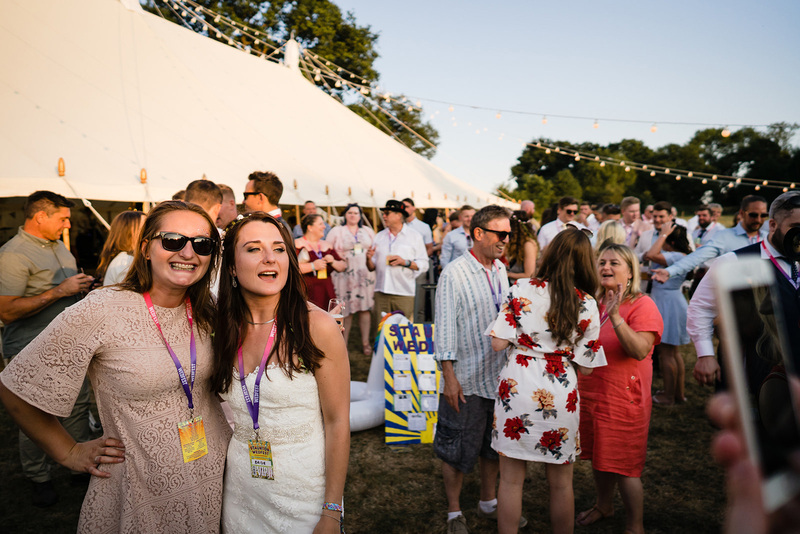 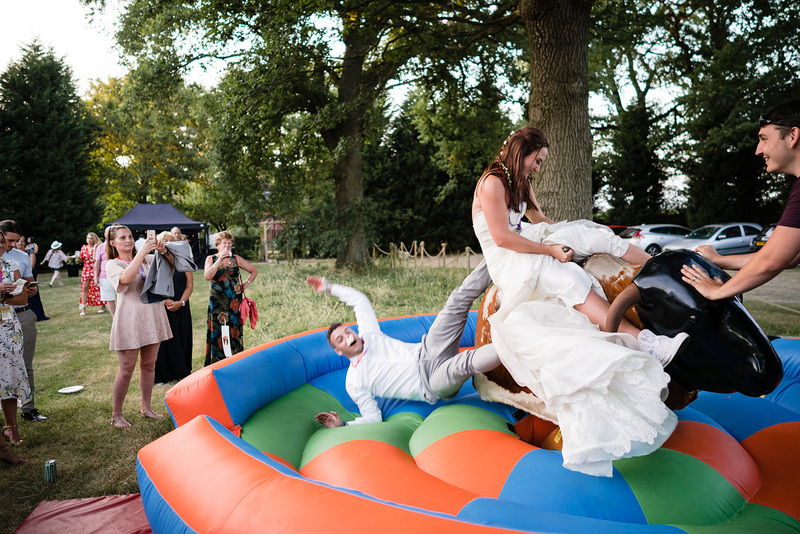 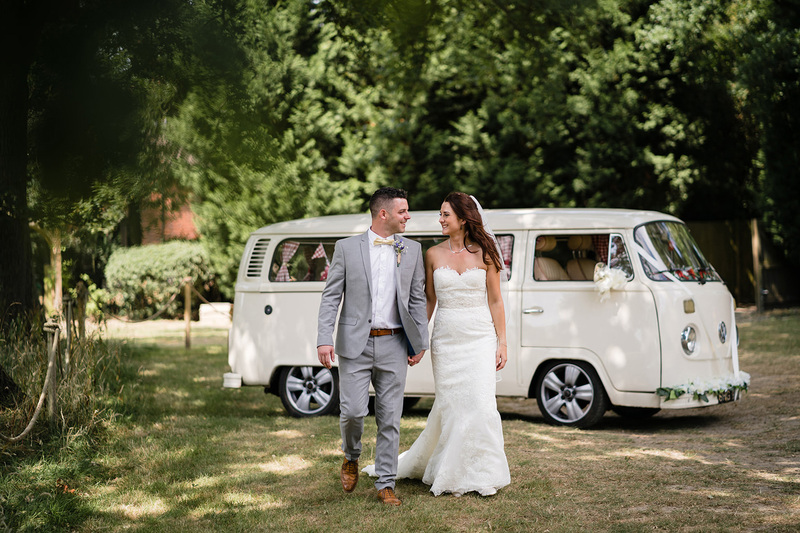 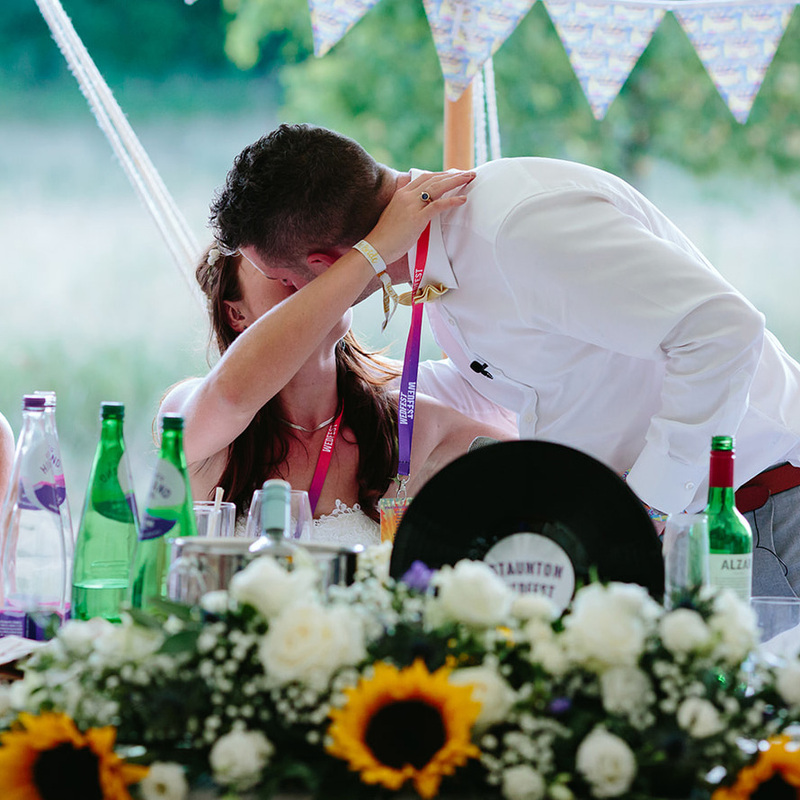 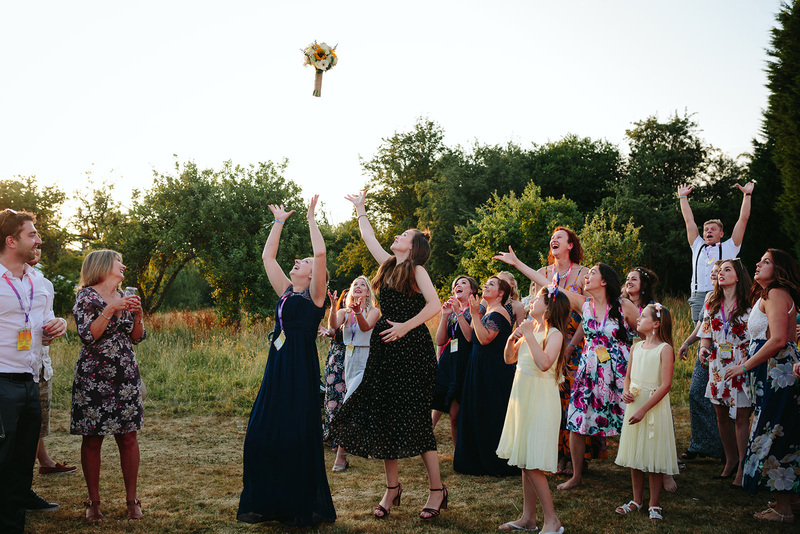 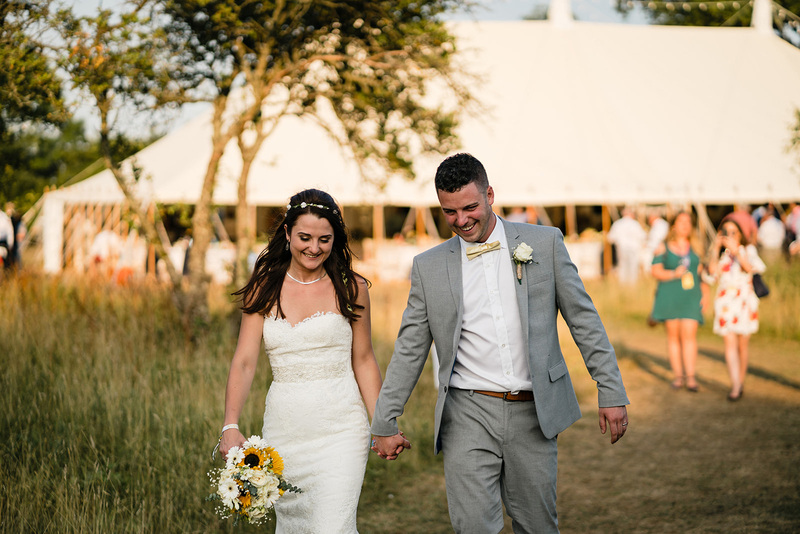 The couple got married in a church and then they and all their wedding guests made their way to Westmead Events, Nutfield which is an amazing 11 acre outdoor wedding, party and event venue in Surrey. 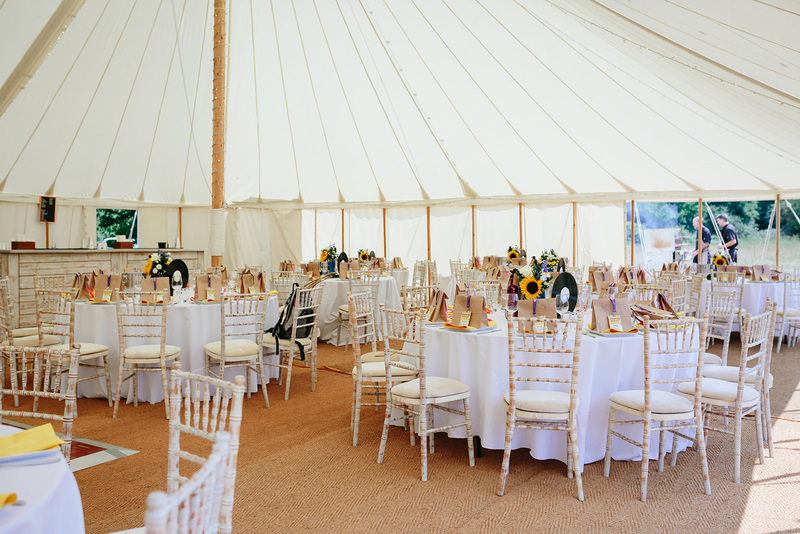 Here the couple were able to transform the area into their dream wedding and as it was their dream wedding festival. 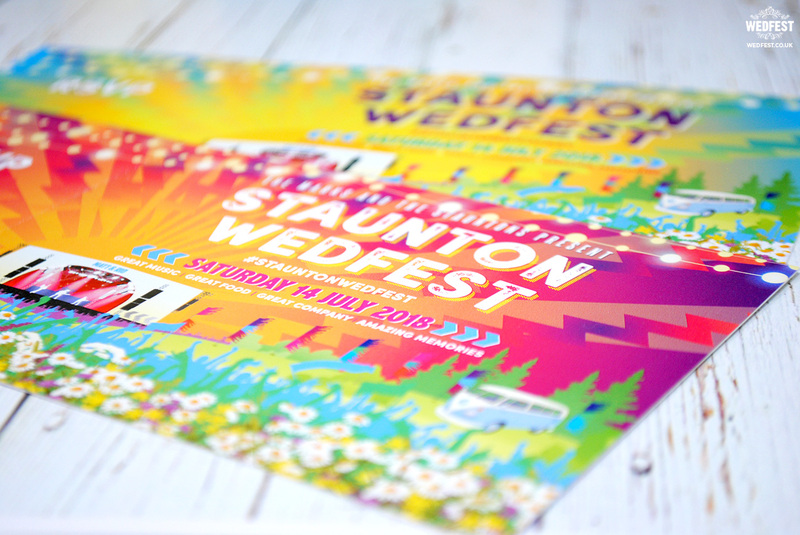 On the invites we had a layout of fields with flowers, festival flags, silhouettes of people dancing, a stage, an electric sun and sky scene with fairy lights all along the top and a VW Camper Bus which would be both their wedding transport and their wedding photo booth later in the evening. 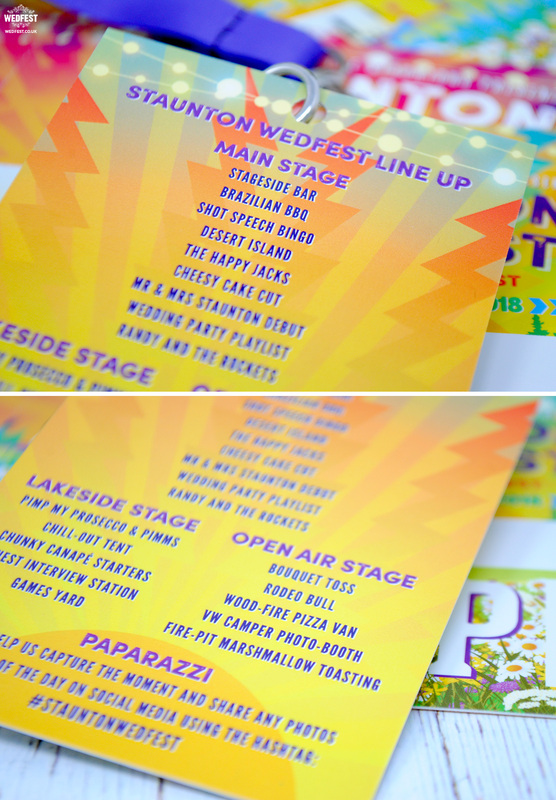 The reverse side of the wedding invites has much fuller detail on the wedding ceremony and reception venues and times for the wedding. 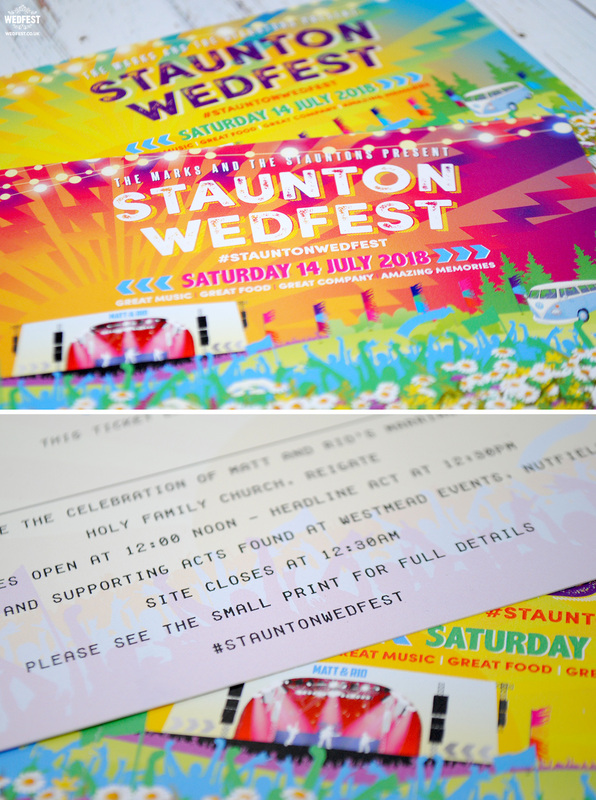 The invites were ticket style so they came with a tear off RSVP card which the guests could fill in and send back to the couple and let them know if they were going to attend the wedding, if they needed to catch the bus and if they needed a parking space at the festival amongst other information. 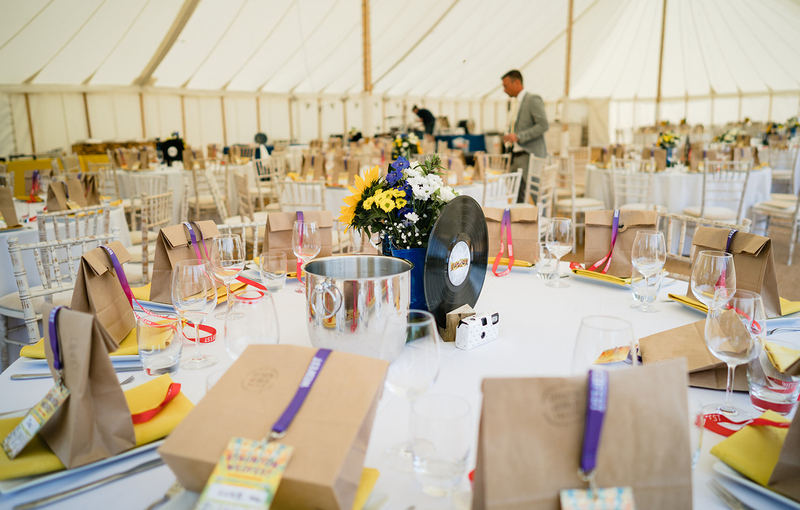 The wedding tables were all decorated beautifully with gorgeous festival themes and music themes all through the decorations. 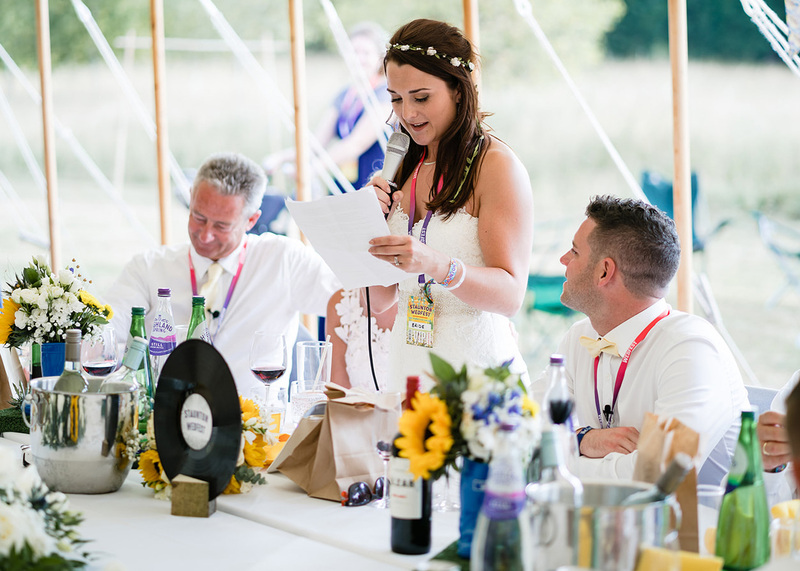 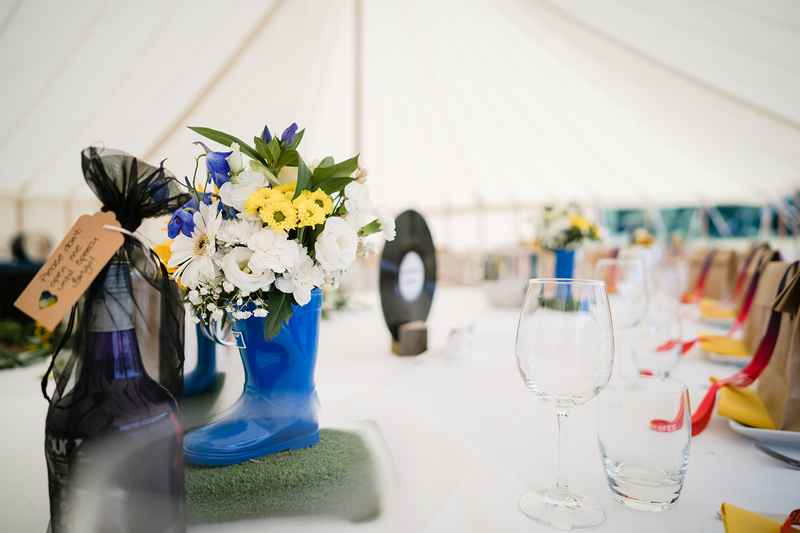 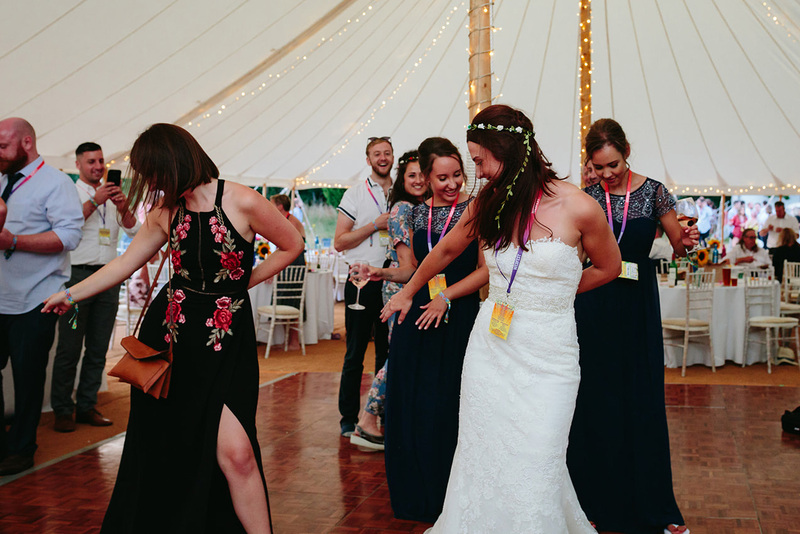 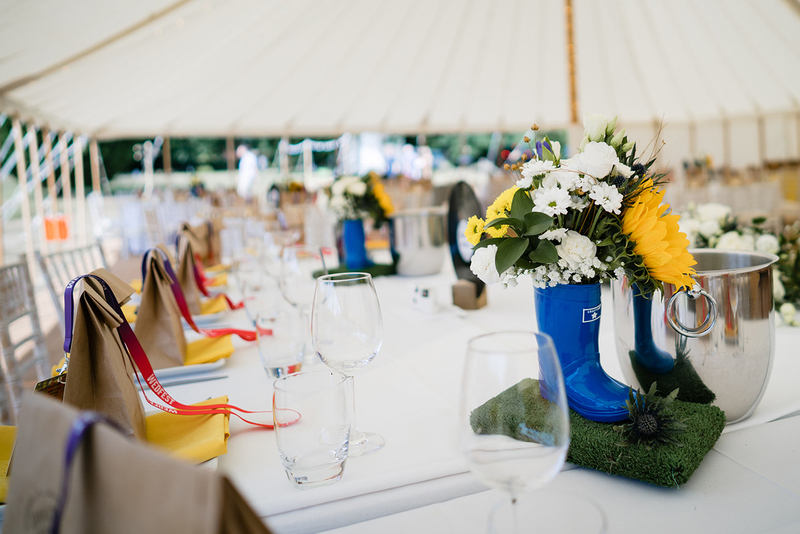 They had flowers in welly boots, music themed vinyl record wedding table names, disposable cameras for the guests to random festival photos and festival party bags for each wedding Guest. 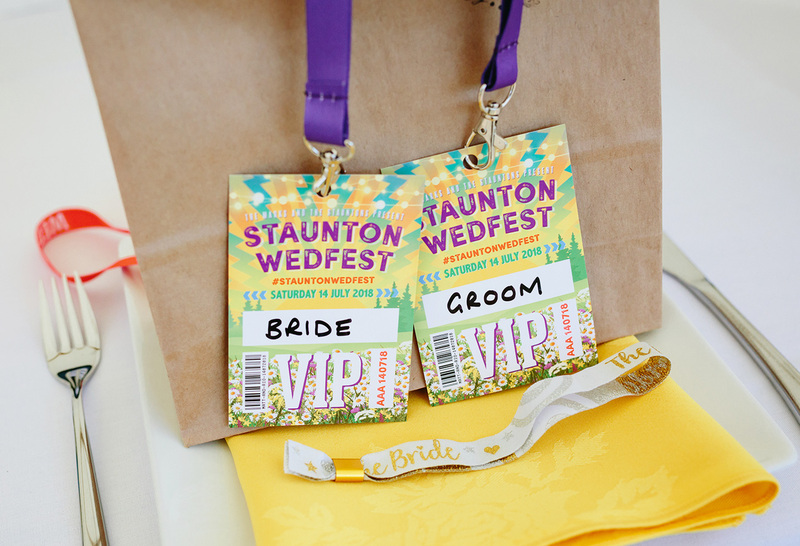 For the wedding tables we made the couple Festival VIP Pass style lanyards which doubled as the wedding place names. 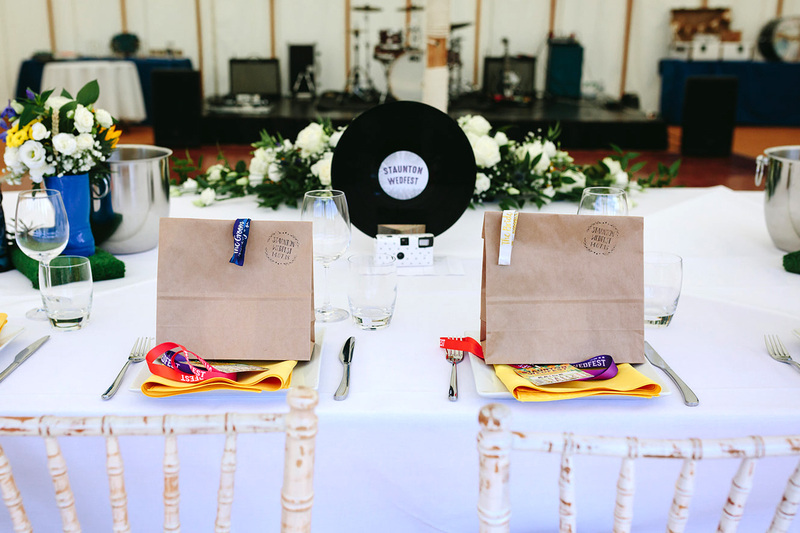 The Wedding Tables had wedding favour bags at each seat and each one had of the wedding lanyards attached to each to let each guest know where they were sitting. 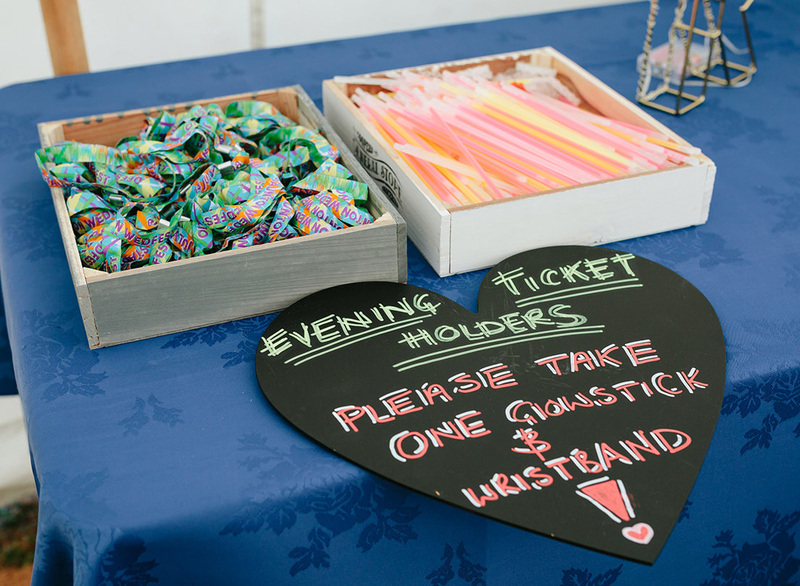 The place cards doubled as festival line up lanyards and the guests all wore them throughout the wedding reception and for the rest of the evening. 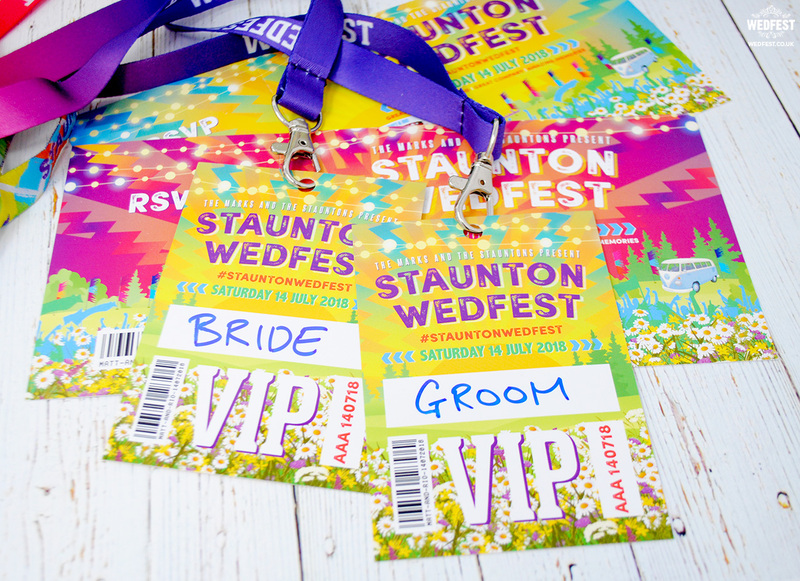 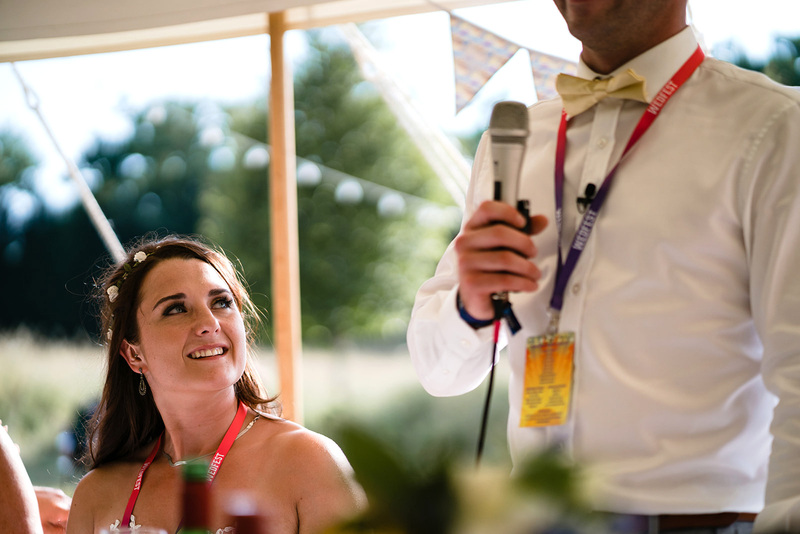 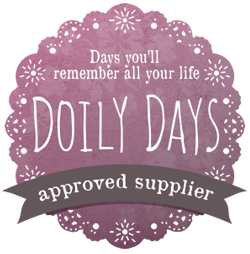 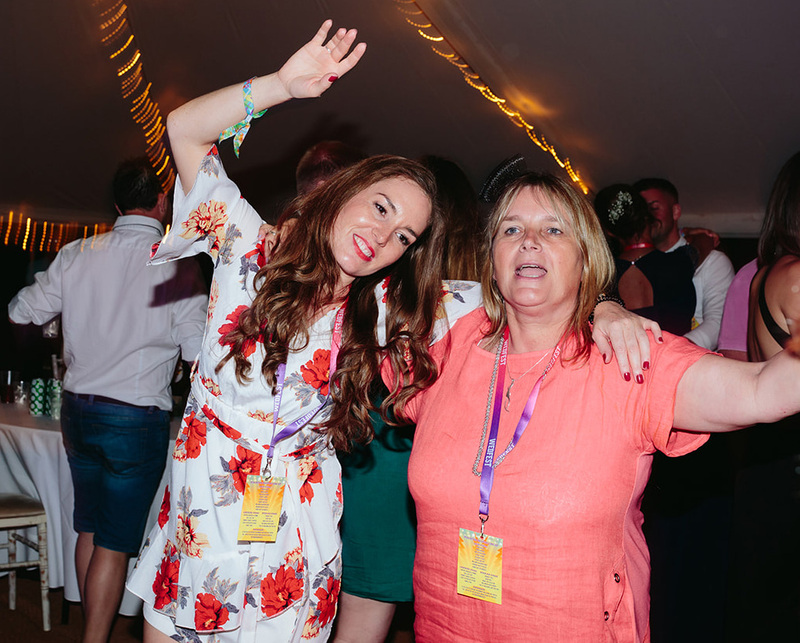 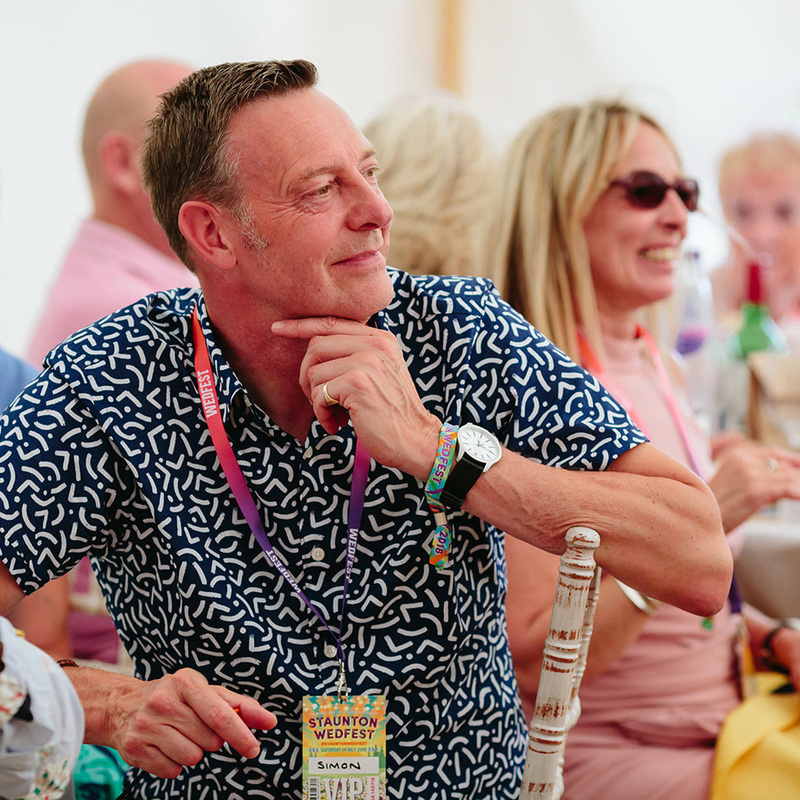 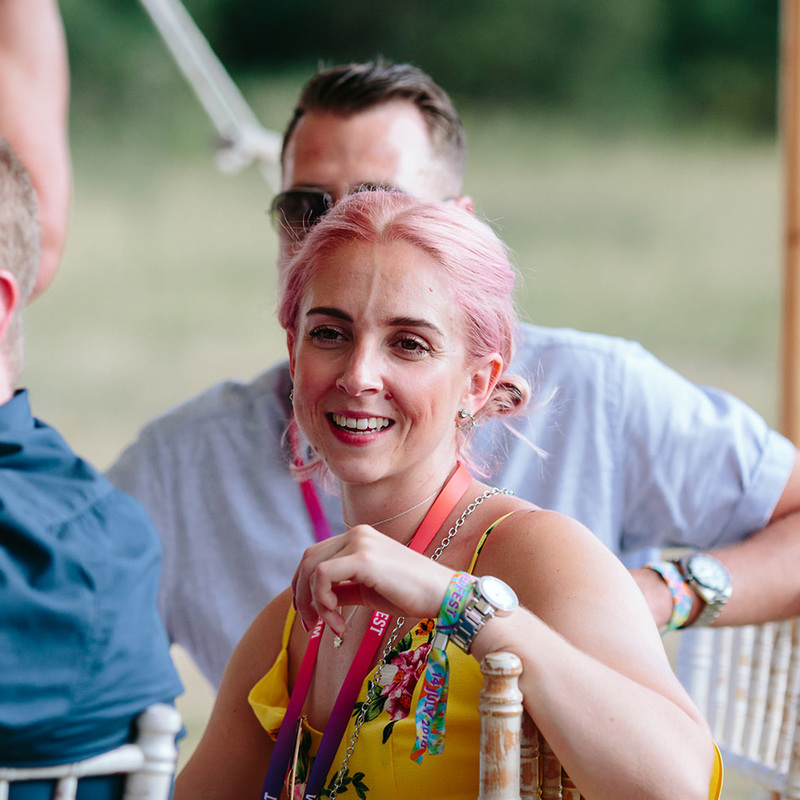 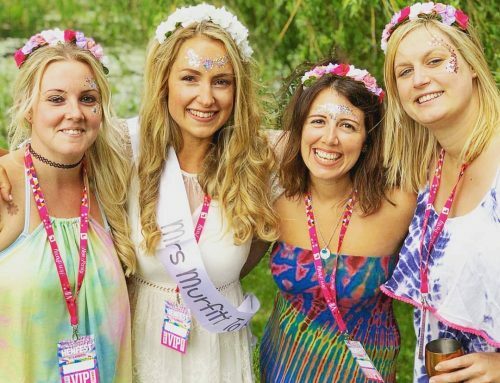 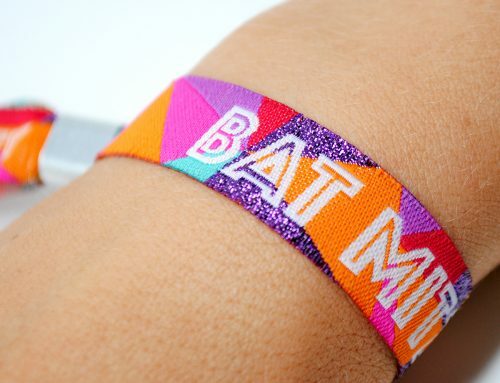 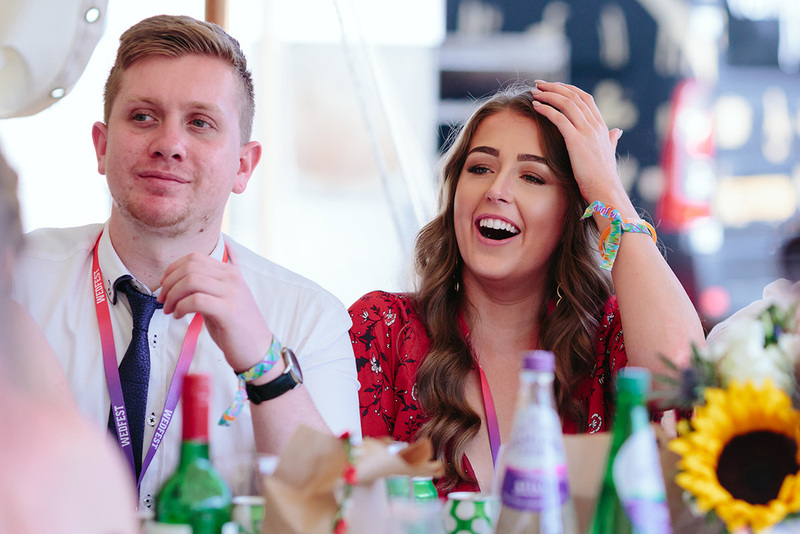 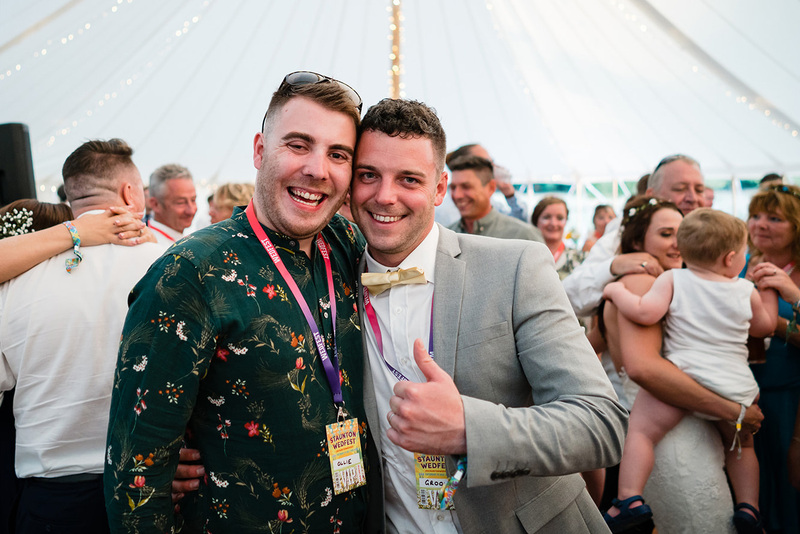 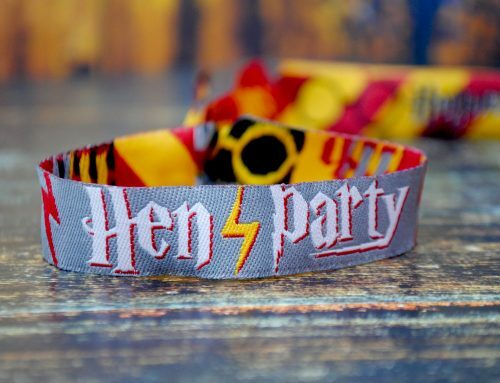 Along with their festival wedding wristbands the vip pass lanyards brought a lot of colour and festival fun to an already colourful and fun filled day. 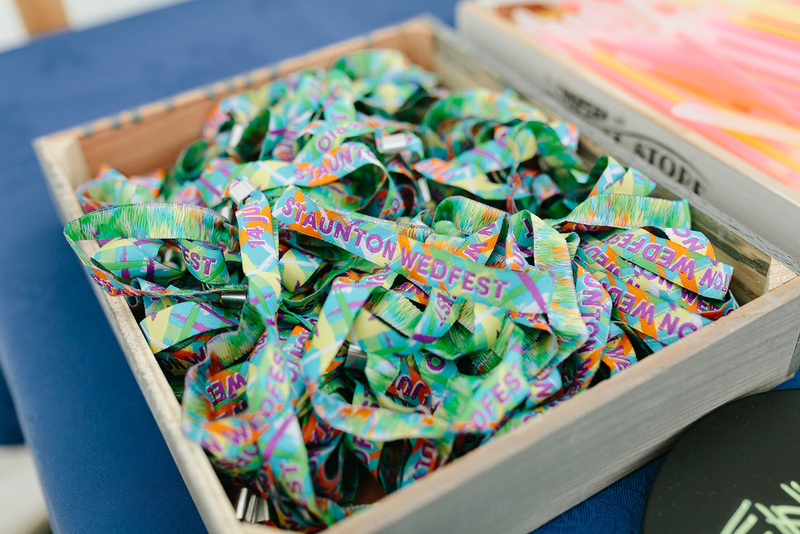 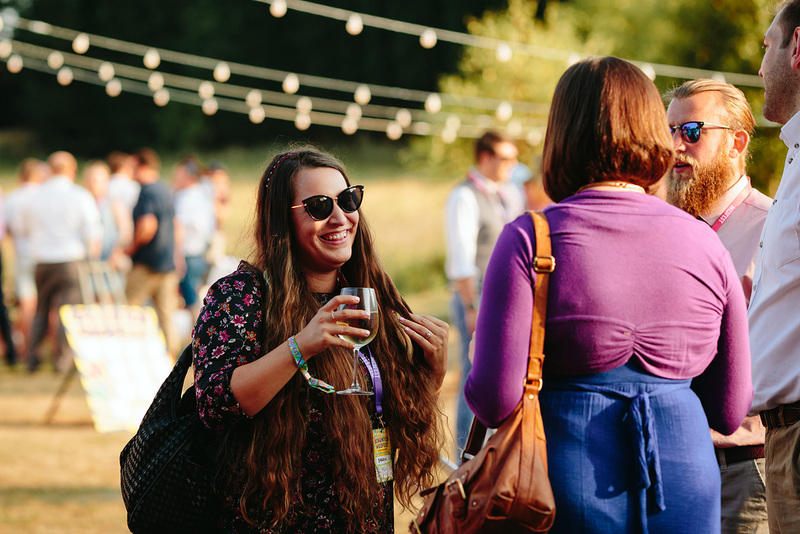 The festival lanyards followed the same design style as the wedding invitations and had an area for each guests name to be written. 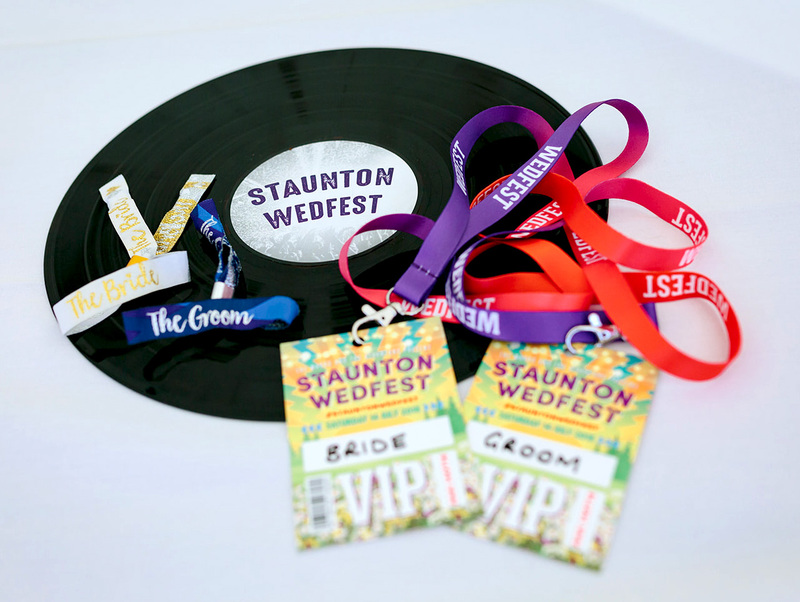 On the reverse side of the vip pass lanyards was the wedding line up which featured information on all the activities of the wedding day including what bars there was, food stalls, the bands that were playing on each stage and some other information the couple wanted to pass on to the guests. 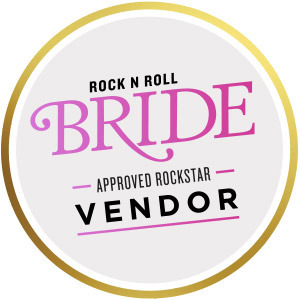 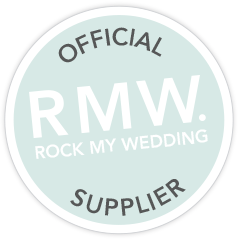 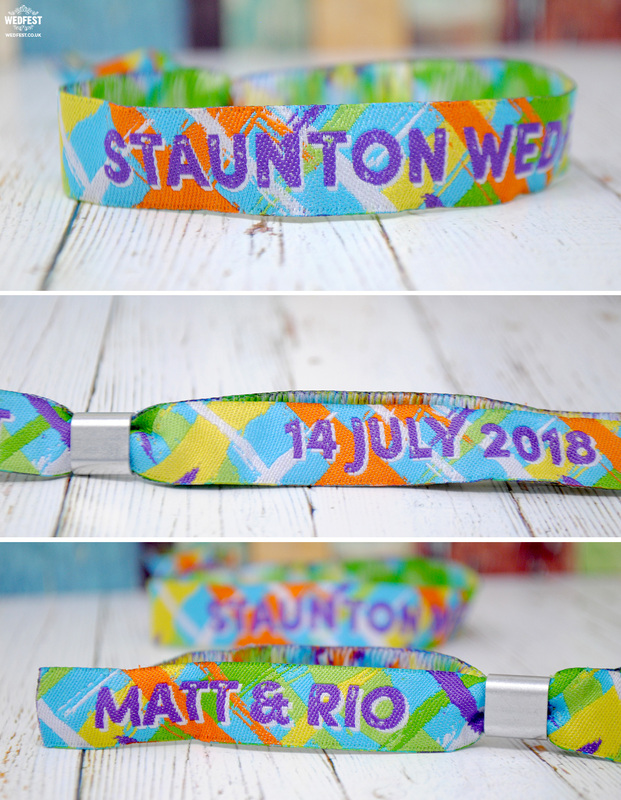 One of the wedding favours that was contained in the wedding party bags was the beautifully made woven fabric festival wristbands which we made for Rio & Matt’s big day. 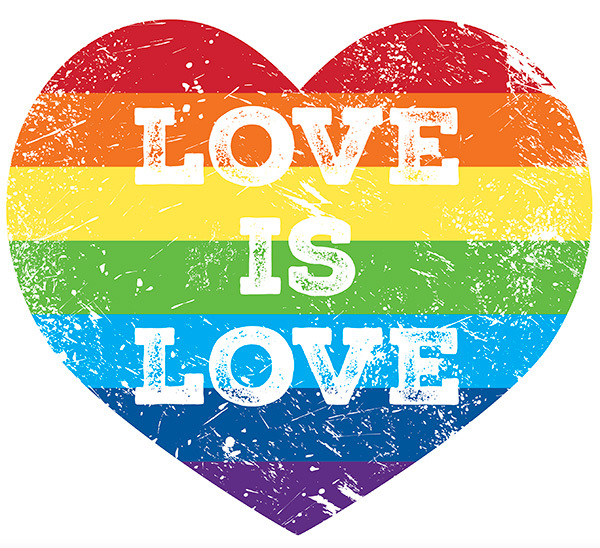 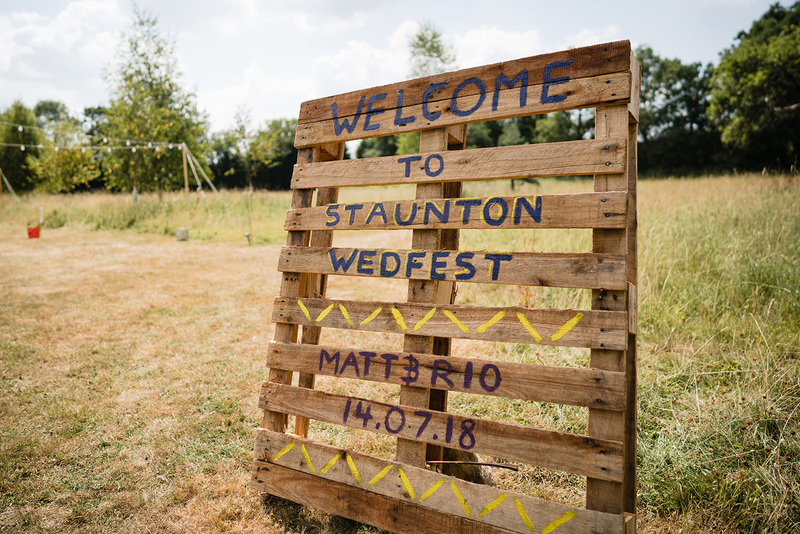 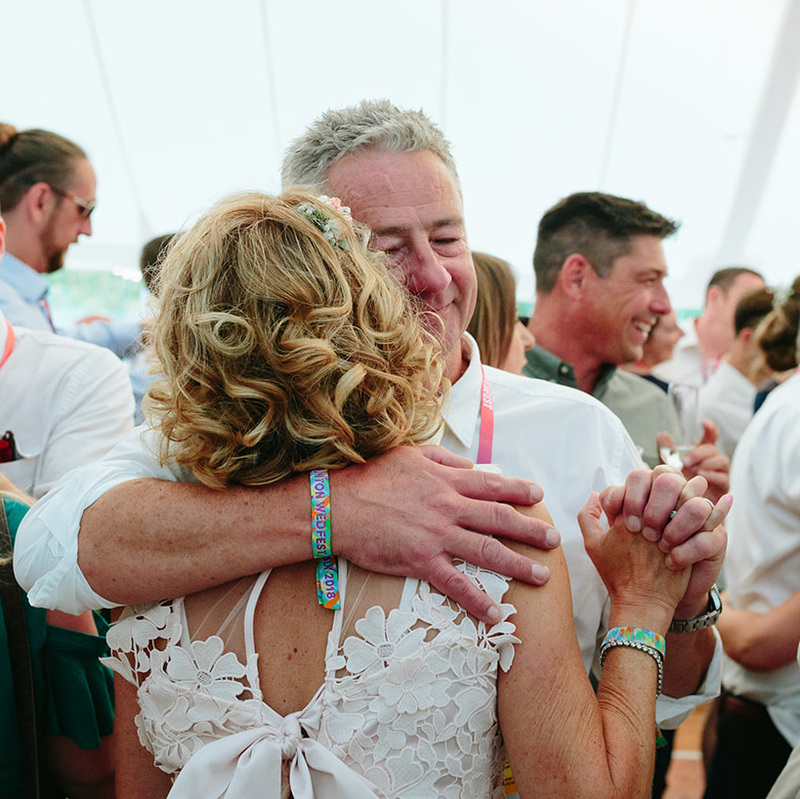 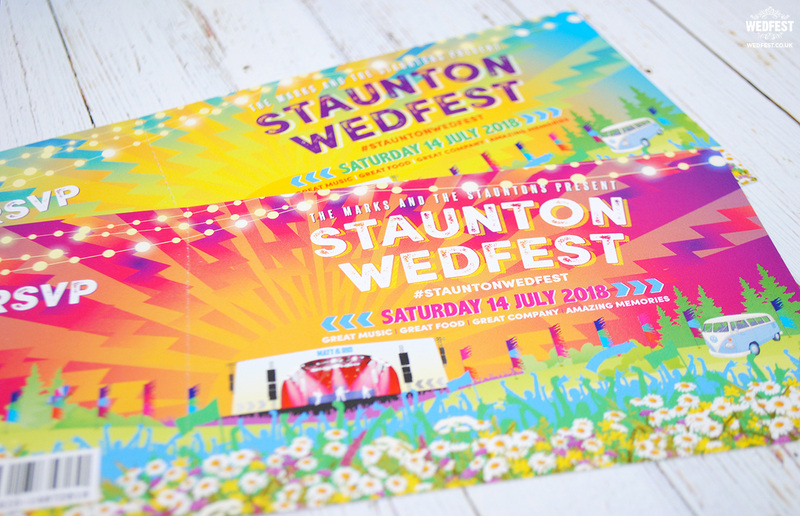 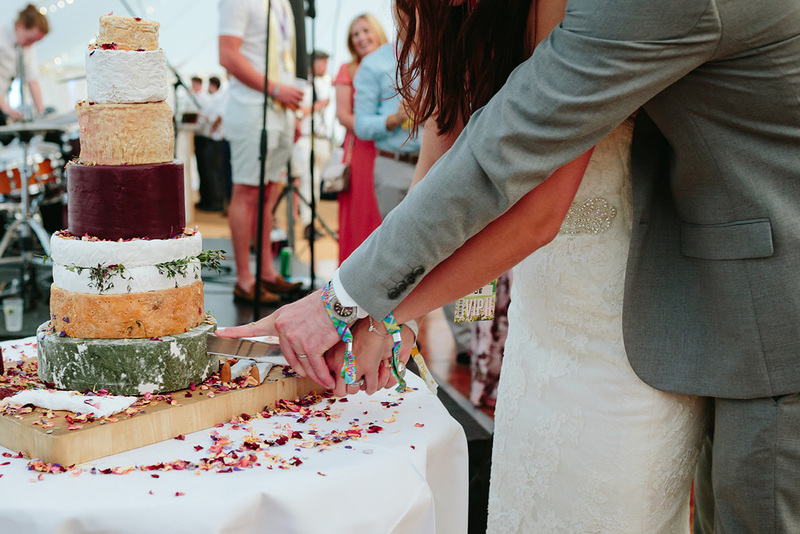 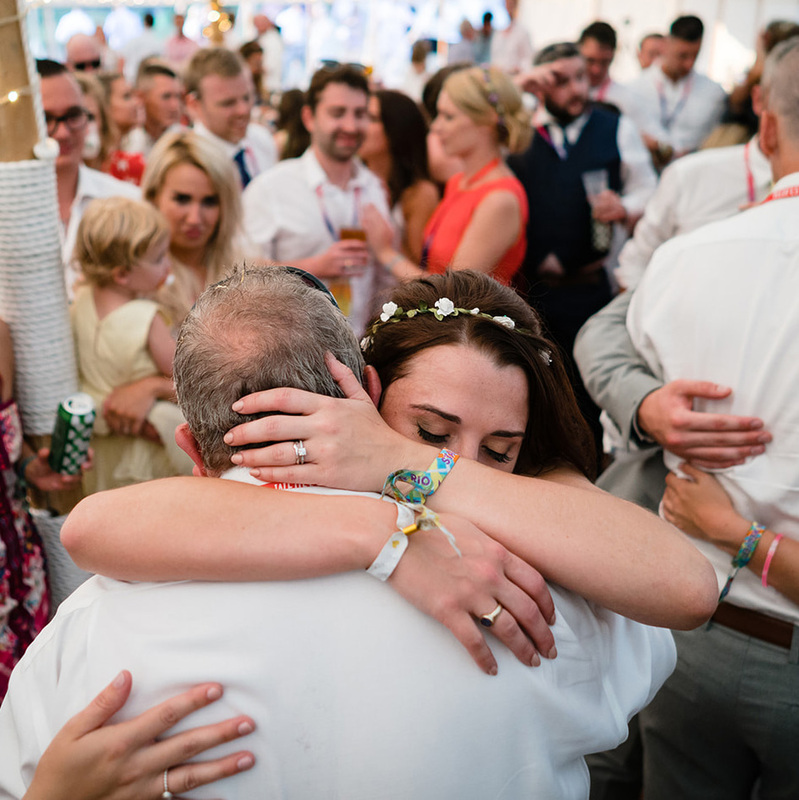 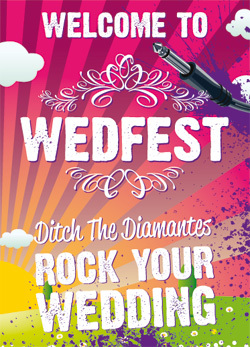 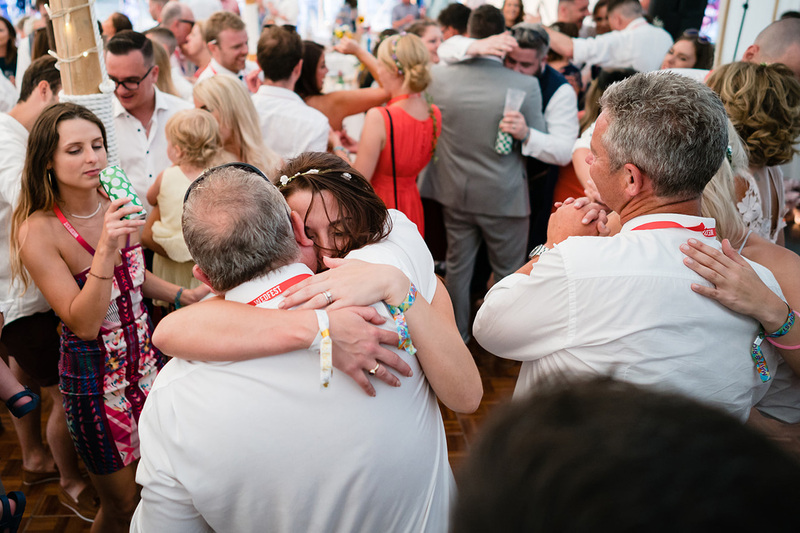 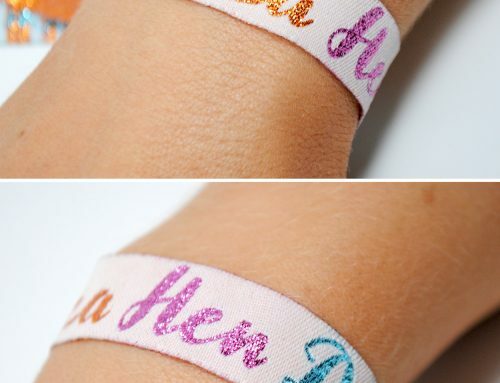 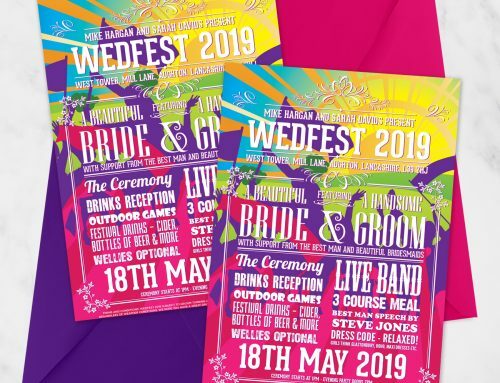 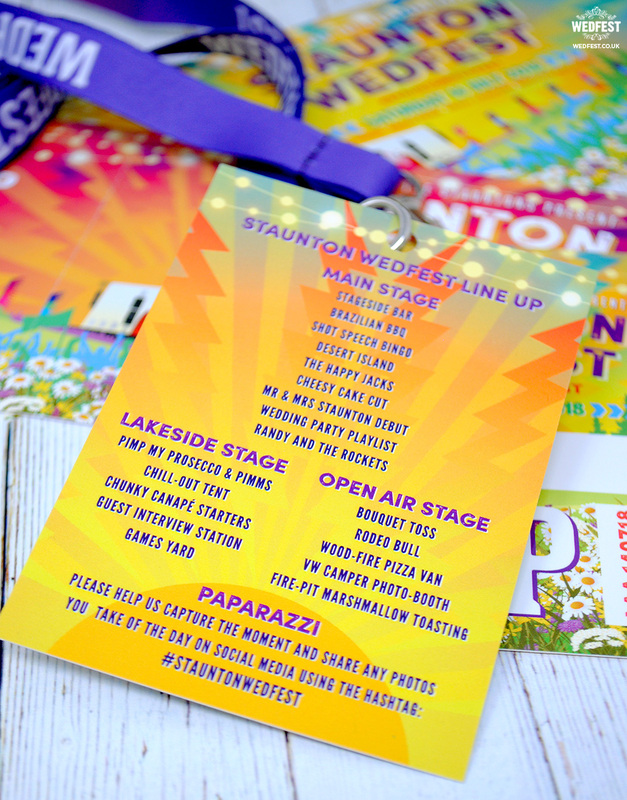 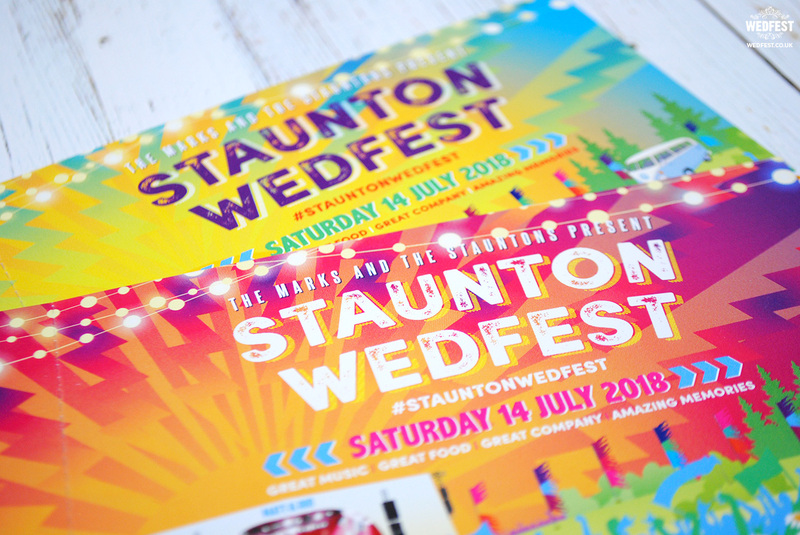 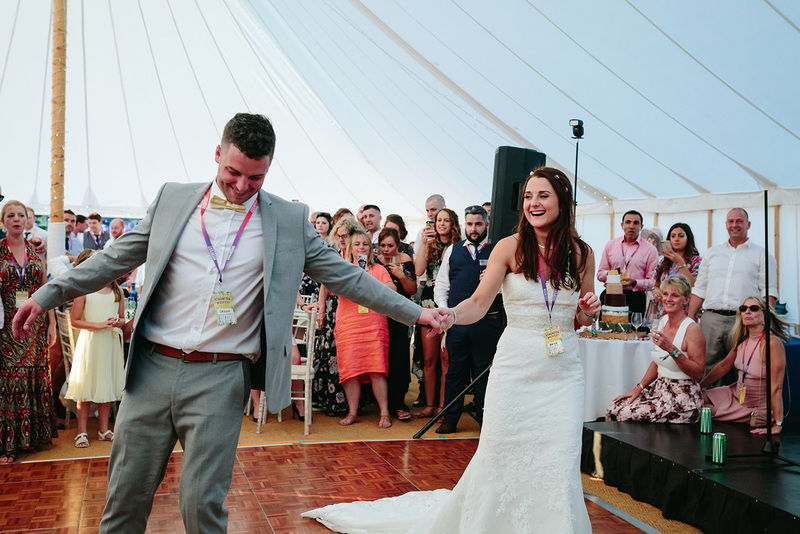 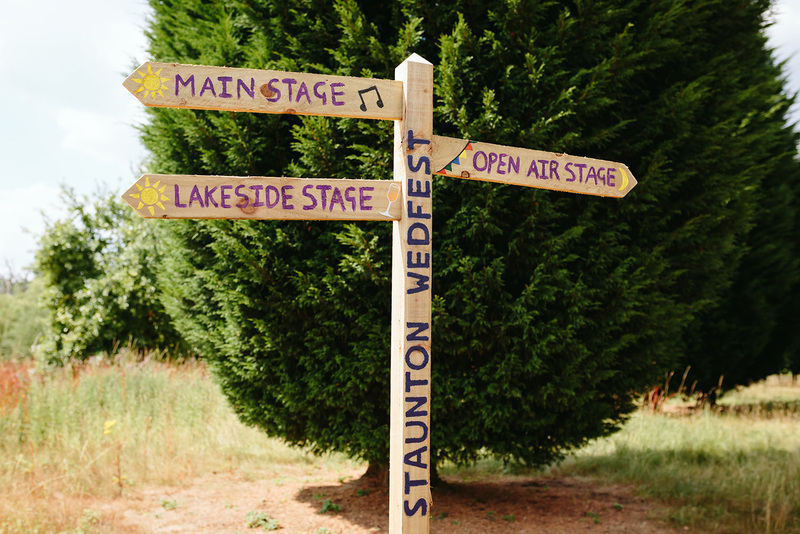 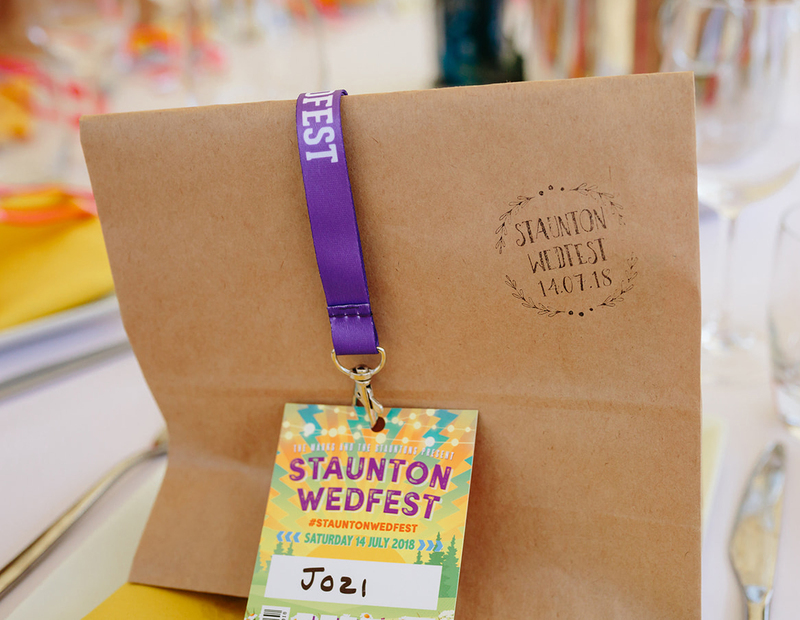 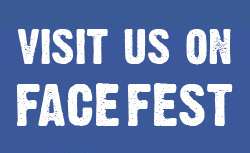 The wedding wristbands featured a multicoloured festival style design with the words STAUNTON WEDFEST as the main text and the couples name and wedding dates on the tails. 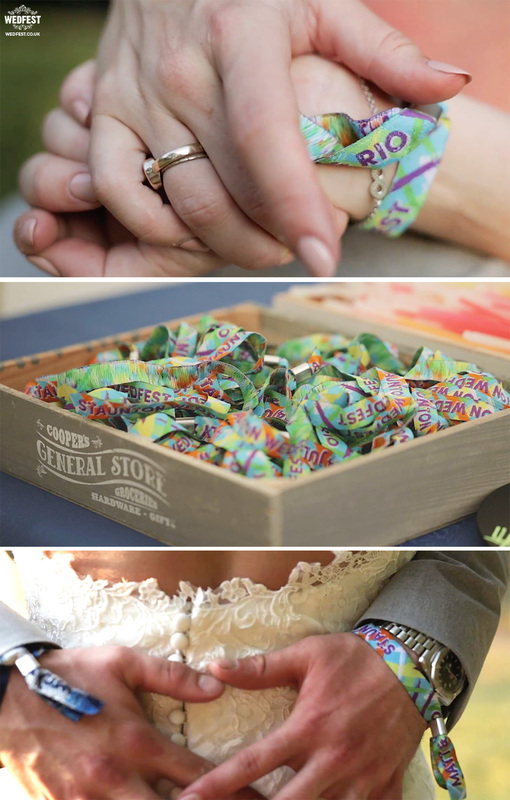 For the evening only guests once they arrived at the reception there was also festival wedding wristbands set out for them and they were encouraged to take and wear one along with some festival glow sticks. 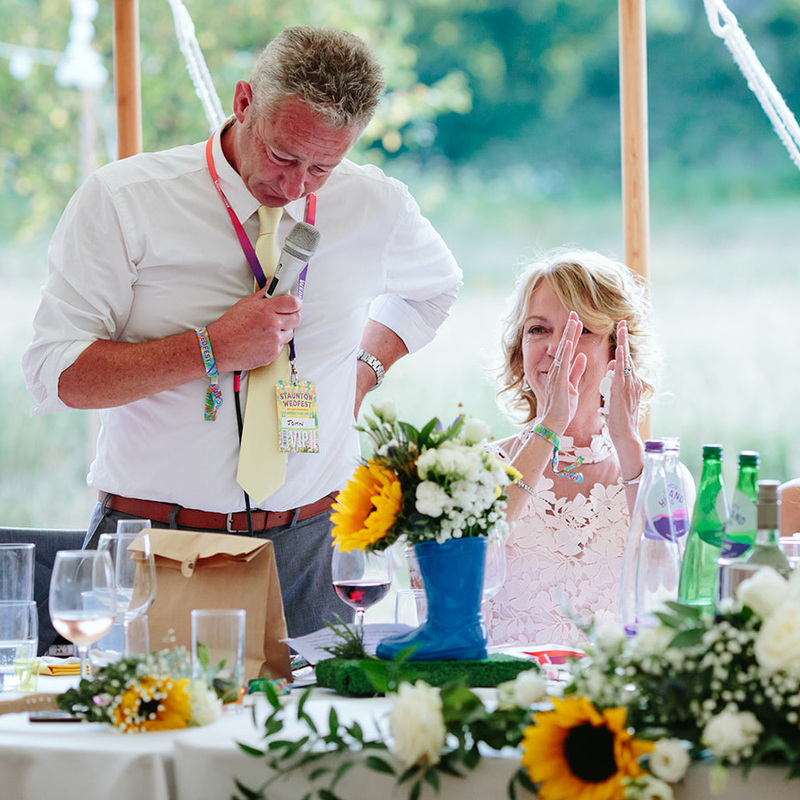 Get up there big man…. 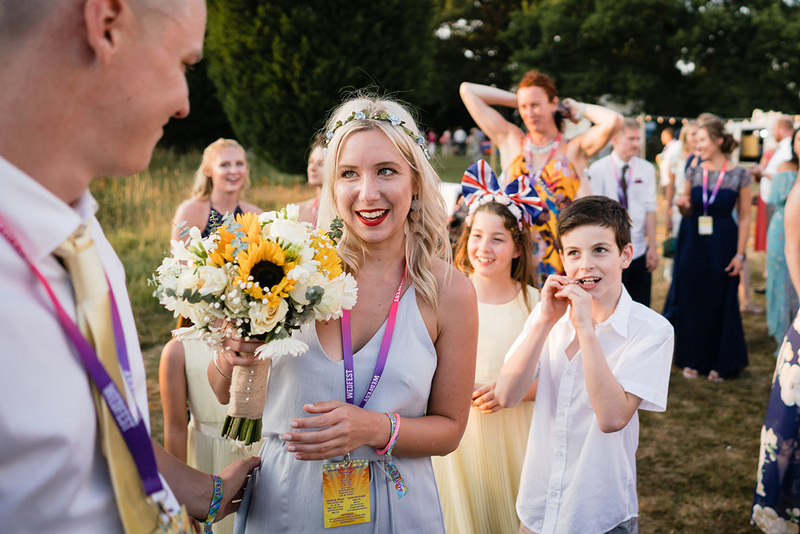 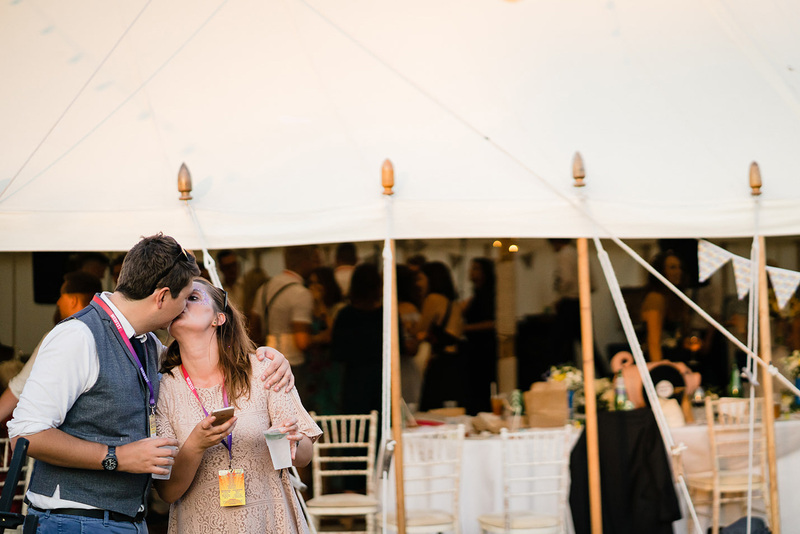 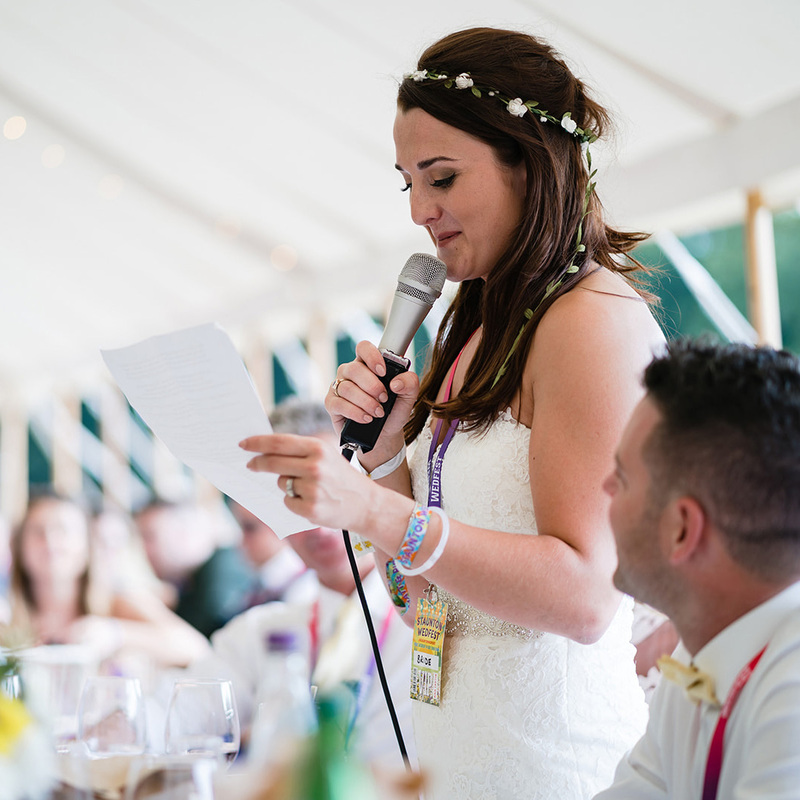 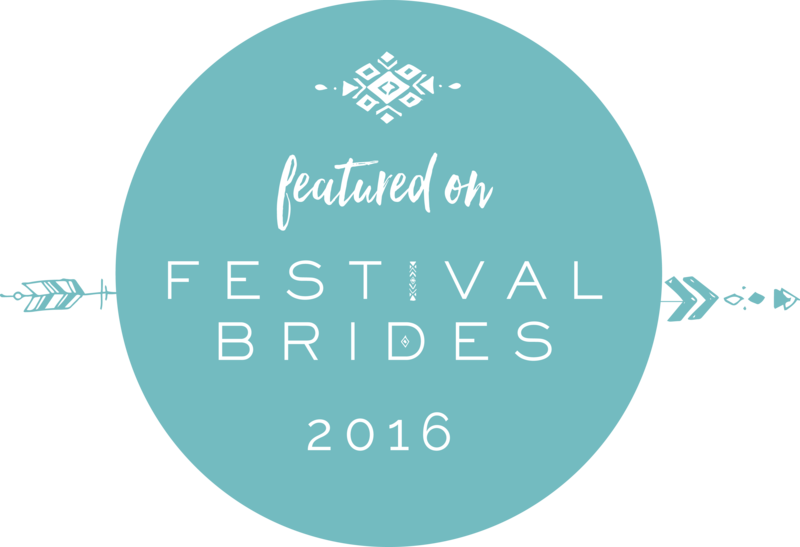 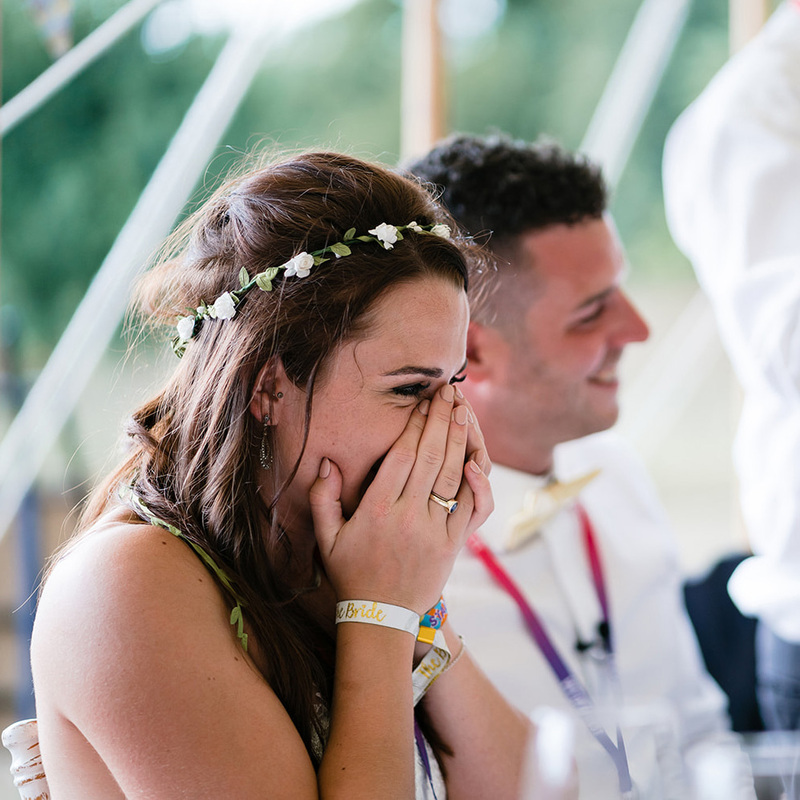 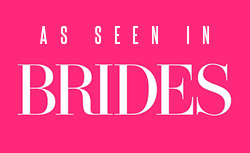 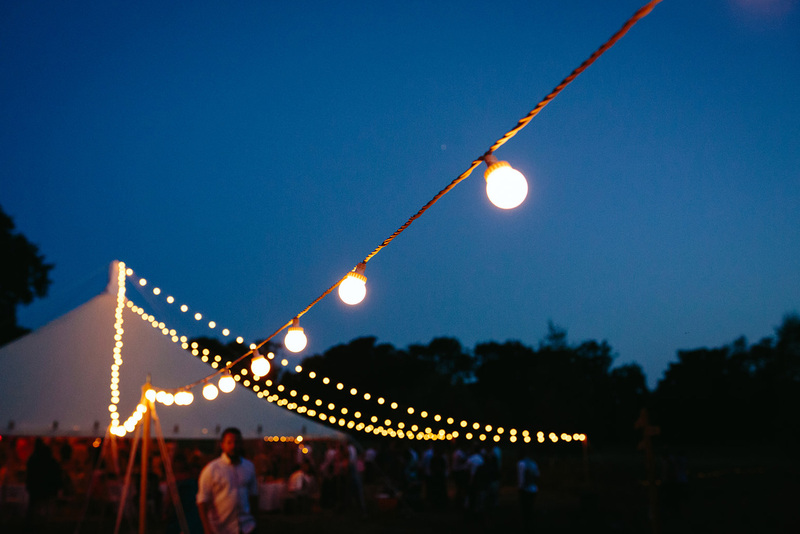 What a totally epic festival wedding!! 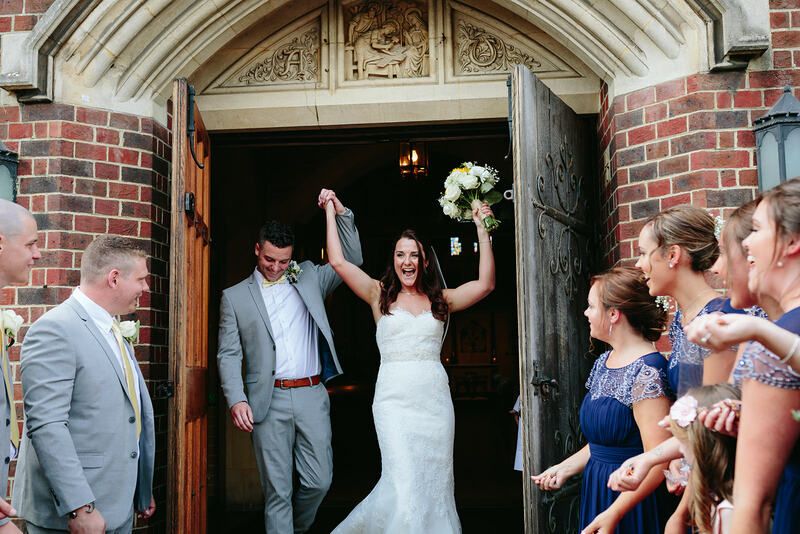 We hope you have loved looking at these photos and video as much as we have. 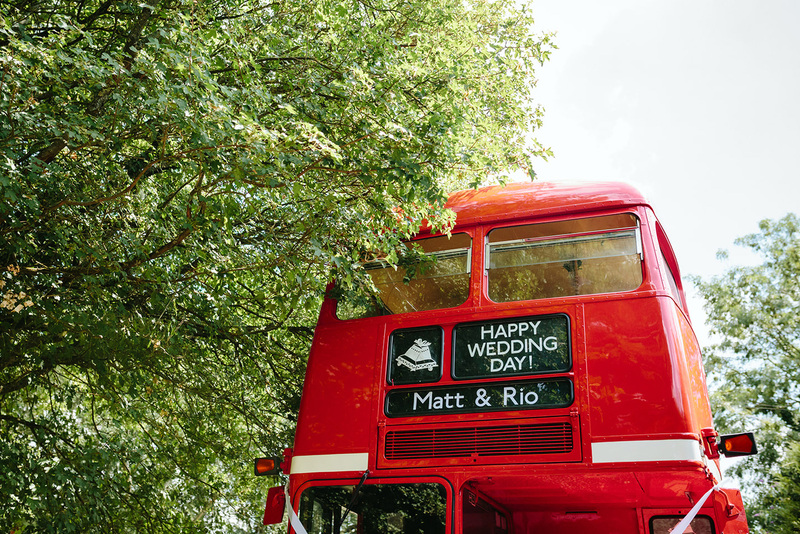 Big thanks to Rio & Matt for letting us share them and we would like to wish them all the best for their future together. 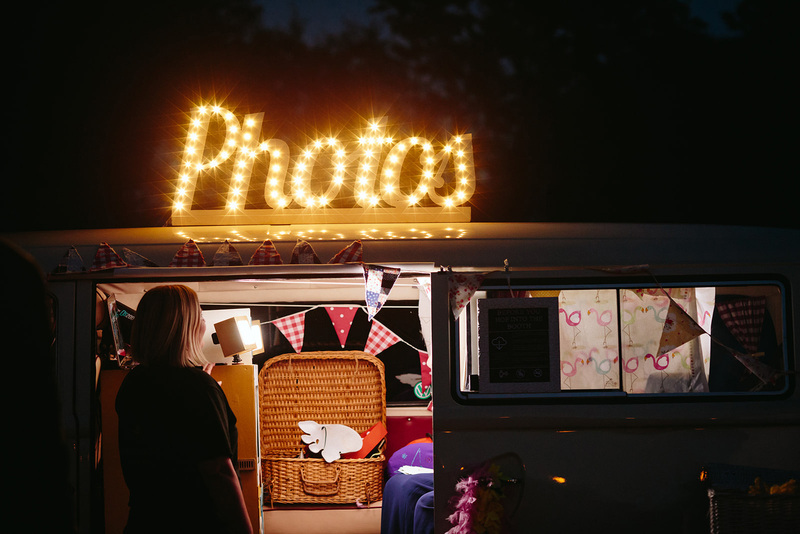 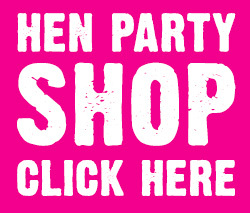 Also big thanks to Real Simple photography, check out their website at the links above for more of their work.